Religious or not Christmas Eve Mass at the Vatican with Pope Francis is a once in a lifetime experience you will never forget! Join us on our Christmas and New Year Tour of The Eternal City, Florence and Venice. Enjoy Christmas Lunch at Antica Trattoria Tritone located in the historical centre of Rome just a step stone away from The Trevi Fountain and Spanish Steps, this unique restaurant maintains its traditional Roman atmosphere making you re-live the past centuries with its wooden beams, vaulted ceilings and ancient stone fire place. Upon arrival, you will be greeted personally by the Camponeschi family, they will make you feel right at home. Spend New Year’s Eve in Venice with a Dinner at Antiche Carampane restaurant! Situated in the heart of Venice, only steps away from Rialto, here you can find distinguished Venetian cuisine in a warm and cozy atmosphere. The restaurant’s gracious outdoor terrace provides the opportunity to dine under the stars when weather permits. With all of the adventures along the way, this will be one Christmas and New Year Festive Season to stay in your memory forever! Our Vatican experience will take us on an amazing journey through the Vatican Museum and into the most beautiful and famous chapel of the world, the Sistine Chapel. During our visit, our guide will have much to share about the way of life of the locals and the amazing power that this tiny state holds with its neighbouring Italy. After the Sistine Chapel, we will continue our journey through the Vatican and into the Basilica of St. Peters where we will admire one of Michelangelo’s most famous masterpieces – La Pieta. After our visit, we will head out into the amazing Piazza which will definitely leave you breathless! The rest of the morning is at your leisure followed by Christmas Lunch at Antica Trattoria Tritone – 3 course dinner with water, wine and coffee or tea included. Upon arrival, you will be greeted personally by the Camponeschi family, they will make you feel right at home. One of the best ways to see and enjoy the highlights of the times of the Roman Empire. During our tour today, our first visit will be to the valley of the Roman Forum, considered the biggest archaeological area in the world. We will then make our way to the inside of the Senate and the Basilica of Constantine. From the outside, we will have the opportunity to admire other ruins such as temples, basilicas and the Reggia. We will enjoy a stroll through the Via Sacra to the Arch of Tito and enjoy the Colosseum, also known as the Flavian Amphitheatre, both outside and inside. With our guide, we will then head to the “Basilica of St. Peter in Chains” to see the Holy Chains of St. Peter and the Moses carved by Michelangelo. We will then continue our drive to admire the Vittoriano known as the Wedding Cake in Piazza Venezia, we suggest a stop for a photo then continue on past the Circus Maximus, Aventino Hill and the Palatino Hill before returning to your hotel. This morning you will meet your Local Guide and drive to Florence stopping en-route in Siena & San Gimignano. Today you will enjoy exploring two of the most famous and beautiful towns of Tuscany. You will pass through the heart of the Chianti region towards your first stop of the day, Siena. During the journey, your driver will give you an amazing introduction to this beautiful region and also to what awaits you in Siena, the must sees on the list, where to shop and of course enjoy a delicious lunch. 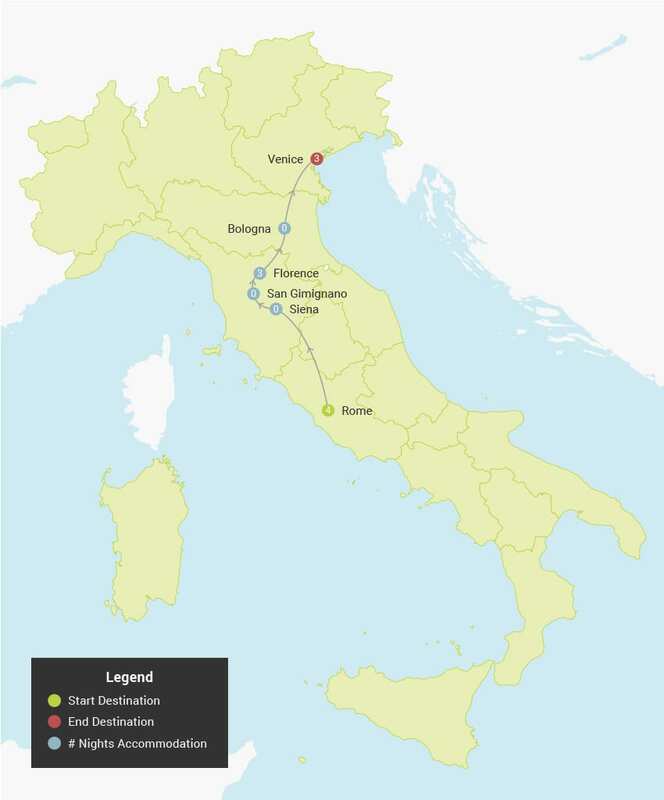 After your time in Siena, you will then continue north west towards the town of San Gimignano. During the ride towards the tower town of San Gimignano your driver will give you the history of this enchanting medieval town and how to get the most of your time here. This morning meet your Local Guide for the perfect introduction to the Highlights of Florence – Duration 5 hours with guide. This evening you will enjoy a 3 course Dinner at Antico Fattore Restaurant with beer, wine & soft drinks included. The kitchen of the Antico Fattore was a real holy of holies and Giulio, the original Proprietor, would only allow friends or food enthusiasts to enter it. This morning with your Local Guide you will enjoy the highlights of the enchanting Chianti Region. Today’s half day tour will not only take you on an amazing introduction to one of Tuscany’s most famous wine areas but you will also discover all the other beauties of the region. Your private driver will show you the local’s way of life and the culture and you will also enjoy a stop in one of the best wineries to enjoy a tasting of some of the best Chianti wines. The journey begins through the gourmet side of Bologna as we stroll through the medieval market admiring all it has to offer and enjoying a wonderful introduction on the Specialities of Bologna by our local expert guide. We will enjoy a visit to a traditional bakery and pasta maker where we will find the Tortellini and Tagliatelle of Bologna. We will also make a stop in one of the popular delicatessens where we will learn about the history of the Mortadella and of course, a stop at one of the traditional Chocolate Makers is a must on the list! This evening enjoy a special New Year’s Eve 3 course Dinner at Antiche Carampane restaurant with beer, wine & soft drinks included. 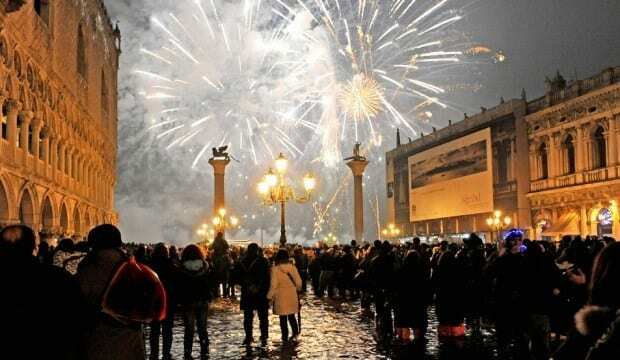 Afterwards wander over to St Marks Square to enjoy the Venice Fireworks as the New Year begins! This afternoon you will meet our guide to begin our journey through the city, eating and drinking as the Venetians do! Duration: 2.5 hours. We will begin our tour exploring the cafés, and cicchetti bars, delve into an authentic side of Venetian culture and of course, enjoy lots of tastings along the way. We will stroll through the area where the famous Rialto Market is held (mornings only) discovering the charming alleyways, “streets” named after the foods and other items that have been sold there for centuries. We will then head towards three of the most popular, local bars serving up cicchetti, Venice’s answer to Spain’s tapas! Enjoy cicchetti of crostini, fritti and Venetian panini alongside prosecco, the popular “bubbly” of the Veneto region, and tastings of both red and white local wine, all included. Once you’ve had your fill it’s time to finish your meal as the Italians do with coffee and grappa, a local “digestive” liquor. Before you part ways with your local expert guide, she will give you some suggestions on where to enjoy dinner this evening. After the tour you will explore this magical city and its Venetian Canals by gondola. Sit back, relax to enjoy the views during this charming ride through the canals with your Gondoliere. This is a perfect way to admire the beauty, charm and elegance of this city and it’s palazzi. Departure transfers are available upon request. Private arrival and departure transfers - as Individual Travellers will be arriving and departing separately, we will provide you with a tailored quotation for these services.